If there was an example of “déjà vu” or “here we go again”, it has to be yesterday’s wake up bombshell of yet another gun shooting into a crowd (in this case this occurred in a school and there have been many similar such incidents in recent years) when Nikolas Cruz, aged 19, an ex-student, (so it is alleged) killed 17 and injured more than a dozen when he opened fire at Marjory Stoneman Douglas High School in Parkland, Florida Wednesday afternoon, leaving us all in shock even though we now see this as a reoccurring theme. The classic ingredients of a drugged, mentally unstable man with a chip on his shoulder hate motive, armed with a semi-automatic firearm, linked to white supremacy (althought that is no being disputed – but still no hint of Islamic ideological indoctrination or illegal immigration) being able to perform such devastation before being eventually apprehended are all present. As I read various comments on social media, including the images above, most were around people expressing righteous indignation that America’s gun laws (backed up by its Second Amendment) has facilitated this. I have written already on similar incidents, the most recent being the Las Vegas shooting (which carries certain similar hallmarks) and also reflected on the tighter gun control argument, which readers can check out if they wish (here, here and here). I couldn’t help also reflecting on the contrast in reactions when last year the UK experienced three (all Islamic extremist related) attacks (two in London, one in Manchester) when the mood was also shock, sadness and empathy but in these cases also uniting as a community and not demonizing certain sections e.g. Muslims. I also felt certain disquiet over what I thought was the sanctimonious attack by some on those who support wider gun ownership given what has just happened. As I say, the question of what to do about guns is not the purpose of this article. What I do note, however, is more polarization and lack of honest debate. I have criticized the anti-gun politicians (usually of a more liberal and globalist leaning ilk) of being beholden to and being in the pockets of special interest groups, but I quite accept the same goes for the pro-gun politicians, specifically the National Rifle Association (NRA). That is one reason why the debate that we need doesn’t happen, which is regrettable and why people who are about to get angry at what I am going to say should listen and join me in wanting to have that honest debate. Sadly, when people get on their high horses, as often happens, rational argument goes out of the window. As a not altogether irrelevant aside, I am glad along with my fellow British countrymen that we do have tight gun control and it appears to work, although the rise in knife crime is worrying and begs the perennial question of how we are to protect ourselves and our families if there is reason to believe authorities can’t / won’t. There are certain elements of the case that don’t add up. 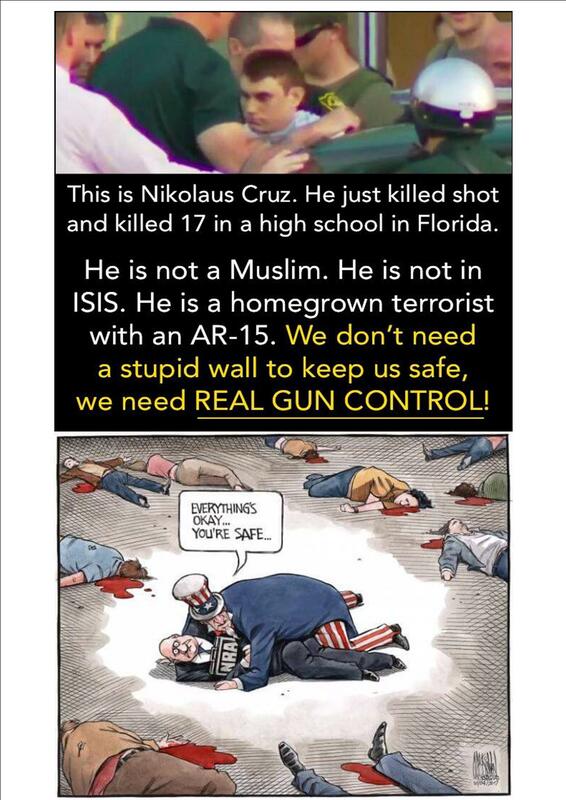 The first is evidence it was not one person (Cruz) doing the shootings but there was at least one other. Then there was the nature of the drills that took place previously and how the incident was handled on the day. Then there was the question of why the named attacker was able to operate as he did, including access to the school despite being a threat. The fact there were unmet mental health needs and behaviour changing drugs involved is worrying. Then why a means for armed protection was not available or better security, given these happenings are not isolated. Then there was the vexed question of how come this incident was allowed to happen given there were previous warnings what was to happen was a strong possibility. Then there is my distrust in mainstream media to report objectively and not merely repeat the official narrative. Then there is the argument of conspiracy theorists / realists this might be a false flag attack by the Deep State to destabilize Trump’s presidency.